The following is the 7th message that we received in Egypt. You can find our other messages on our website at www.alunajoy.com under the "Articles for Personal and Planetary Transformation" link. It might be a good idea to read them in order as each message builds upon the previous one. We are sharing this message here with you just as we received it, in present time, with very little editing. We do this for a very important reason. We know the messages that we receive are not just for our groups, but are for others as well. The Immortals, Horus, the Hathors, and other Star Masters and the Star Elders assure me that the message and the corresponding energy will be transmitted to you. So as you read this, you might want to imagine that you are with us. Also, always view the photos on the web site that we share, as photos also hold some energy of the sites. Our group walks up the stairs to the Temple of Hatchepsut, and we walk into the inner courtyard of the temple area. The entire rear of the temple is caressed by a mountain side. We have the temple to ourselves. Aluna started this message by saying . . . You notice how your eyes are drawn upward here. There are Golden Guardians all the way around the mountainsides watching over us. They recognized us when we came in. When they recognize us like this, it is a good sign. It is really quiet, energetically, here today, and I asked the Golden Guardians "Why is it so quiet today? I am not feeling very much." And they said "It is over. It is done!" And I said "What is over and why is it done?" (The guardians began to share a story as Aluna translates). This site was built by a powerful and wise woman, the goddess Hatchepsut, who had to pretend to be a man in order to be accepted. She had to wear a costume. She had to pretend to be something she wasn't in order to create space to fulfill her destiny. She had to create an illusion on the outside, so she could let out the truth that was inside of her. This was so true for so many human beings . . . not just women, but for men also. We have had to adapt to an environment that was somewhat foreign to our spirits. We needed to be able to fit in the world, so we would be able to let out what we have inside of us. You know the saying "Be in the world but not of it"? We have lived in this world, but we have not been of it. We have been the misfits and the rebels. So . . . this site teaches us a lot about wearing masks . . . not too hide who we are, but to create a necessary space in this world to let out who we are so we can do our work. What is over? What is done? It is that we don't have to wear masks anymore. The Golden Guardians are talking about using authentic power; not false power. In spite of the grandeur of this place, I am sure that you have also tuned into the sweetness. So the grandeur of this Temple is the mask. The sweetness is the heart or the destiny. I am feeling now the Goddess Hatchepsut and she is sharing that we, all of us immigrants (misfits and rebels) can take our masks off now. She is also sharing that most in this group do not wear masks, and the ones that do have nearly dissolved them. When we were walking up the ramp to the main Temple, I was feeling a great recognition and acknowledgment from the Golden Guardians. This acknowledgment validated how committed we are to being our authentic selves. We know it is a work in progress but, we don't have to dress up to play a part. We don't have to dress up to look all spiritual on the outside, because we are already awakened to what we have on the inside. When we have to pretend that we are something else on the outside, when we need to create an illusion on the outside, it usually means something is missing or un-awakened on the inside. This will no longer work for those that try this ploy anymore. The world is becoming transparent. I know that some of us are wearing Egyptian clothes today, but the guardians are not regarding these as a costume or mask. They understand that you are wearing these things for fun. It is okay to dress up for fun and to decorate and celebrate yourself. You are not wearing these things to try to appear to be somebody you are not. What we are talking about here is about the intent to deceive. Do you intend to create an illusion or to appear that you are something that you are not? This is what they are talking about. I really appreciate our groups, because we are working toward total authenticity because we know what we have in here (Aluna points to her heart). So, when we walked in this temple, the guardians said it is finished; not just for us, or humanity, but for the entire age. We have arrived. We have awakened to the fact that the outer has nothing to do with what we have on the inside. So it doesn't matter what we wear or how we look. We don't have to speak in holy languages or wear holy looking clothes. We can just speak and live from our hearts. We are authentic. We are real. This is a goal that we maintain daily with each action that we take in the world. 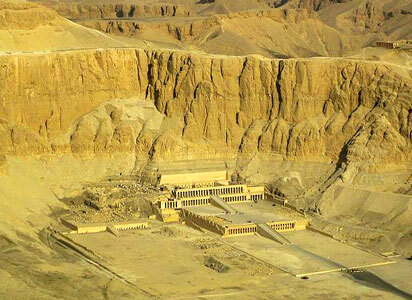 Goddess Hatchepsut wanted to be authentic when she was residing here. But she couldn't, because it was in an age that did not support a woman in the position she was destined to hold. But that was then, and this is now. I am feeling an honoring coming from her to the group (and those that read this). She says that her children have come back, and we are now living the message that she envisioned so long ago. We are authentic, we are truth, we are light. We are being who we are. Each one is uniquely different. We allow each person to have their own individual personal path, whatever that is, and yet we are all bonded in unity in the diversity. It is exactly what she came here to teach. Seeds grow slowly, but she says that she feels successful with us standing here now. We have validated her as she has validated us. But because we know what we have in our hearts, we did not need the validation. She watched us come up to the Temple with good hearts, and she knows that what she anchored here has taken hold in this world. Hatchepsut is a humble being. But on the outside, she looked so grand. She wore the costume. She exuded this powerful presence so that no one would question her on the outside. But on the inside, she was like us. She was just a humble, simple student of life wanting to fulfill her destiny and to be of service to humanity in a time and a culture where this type of teaching was not being supported. She was a warrior of truth, and truth is a bridge to the light. Hatchepsut also says that we are warriors as well, because we had to endure this life. It is not until recently, in the last few years, that we could really be who we came here to be. So in many ways we were like Hatchepsut. Only now, instead of just one being holding the space for authenticity, truth and light, there are many of us. There are thousands and thousands across the Earth that are holding this space. So the seed has sprouted, germinated and now re-seeded. So Hatchepsut is saying she honors us for the courage it took for us to take off our masks, to come out of the closet and to be who we are in spite of the fact that it is not particularly socially acceptable for a lot of things that we believe. Some of our visions may argue with dogmatic religions. Our beliefs may argue with the unspoken rules in our social order in this world. We are the warriors and the system breakers. We are the weak link in the chain that breaks the world apart, so we can build a new one. In this way, being a weak link in the chain takes the most strength, because you have to let go of what is easy, and do the right thing. Does that make sense? We have to break apart the old world. So, we have offered ourselves to be that weak link so we can let the world bust apart. This takes strength and courage. Now all of the guardians, that are surrounding us, look like they are sending down beautiful vases or urns filled with something. They are pouring Golden energy over us. This is a blessing, but you need to give permission inside your heart for this to take place. Some of the Golden Guardians are helping dissolve what is left of our masks and costumes. They are taking care of us. It looks like these are all of Hatchepsut's soul sisters. So, we have blossomed inside of ourselves to the level where she was when she built this Temple. Now she is asking us to take it to yet another level. In other words, we are being asked to be more of who we are in the outside world no matter what. And she is inviting us, if we wish to commit to this endeavor, to take it another step . . . to let this seed of awakening consciousness grow even further inside of us. And what takes place inside of us, does affect the rest of the world. 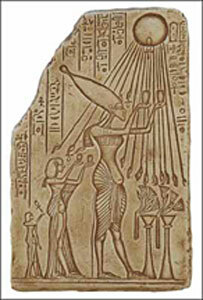 In Hatchepsut's lifetime, she could only take this concept, vision and energy only so far. Hatchepsut would like to help us unmask ourselves to be more transparent. Okay, I am always looking for the back story . . . So I am asking "Okay, that sounds really nice and pretty to be unmasked, to be more authentic, but what are the ramifications?" Because I have discovered that there is always a backside that we want to be prepared for. Change always triggers unexpected experiences. And they say "You are going to feel vulnerable, because you are stepping into new territory. You are going to open up and let something inside of you out. You will shine a light that you have never let anyone see before." So you are going to feel a little vulnerable, and being vulnerable feels a little bit uncomfortable. Are you going to do this anyway? Yes! Absolutely! It is what we came here to do. So remember that it is a good signpost that you are becoming more authentic, if you are feeling a little more vulnerable. You are stepping into a place where you have not gone before. So just let your light shine. Hatchepsut is sharing a bit of her history . . . She was one of the lighted ones that survived Atlantis, and she built this Temple with some of the energy of Atlantis that she still contained. The only other Temple, that was built after the fall of Atlantis that I know that is like this is Luxor. She understood the alchemy of Atlantis, and she tried her best to anchor some of that here. It was hard work to do. But the age that the world moved into after the fall of Atlantis wouldn't support that kind of energy. This is the age that we are leaving now. The Earth had to go through its dark cycle. We had to be reborn. We get reborn in our own spiritual path, and the Earth gets reborn as well. Okay… a new energy is coming in now, and I don't have a clue who it is. It is a beautiful energy, and it has gotten my attention. It is kind of a King-like energy, but a King of the heart. Not a King of the mind. Ohhh, this is the first time that I felt Akhenaton. Oh . . . he was a system buster, a warrior and a rebel too. He was the weak link in his chain, because he changed the way everybody thought about God, because he knew that there was only ONE. He brought lower and upper Egypt together. He got rid of all the gods and began to anchor unity and diversity. Is everybody feeling a pressure in their chest now, right around the heart area? Akhenaton is giving us a beautiful energy download. I don't know much of his story. I make a point of not reading history or archaeology for a journey, because I know it changes my perception tremendously. So I don't know what Akhenaton has to do with Hatchepsut. But he is definitely here. Now that I have felt him I will know him next time we meet. Group member Jyri: I feel it is about the core energy. When I came here, I felt like there was a big ball of energy and it has these rings around it, and I wondered what it was. And then there was a connection with the core of the Earth, and I was thinking (wondering) if they were doing work at the core of the Earth; But it is just the core energy. The same that we have in the light body . . . The core crystal. Aluna: I am also feeling Horus' wings wrapped around us. But he has been with us ever since we went to Edfu . . . the Horus Temple. Horus is about integrity and victory over the darkness. 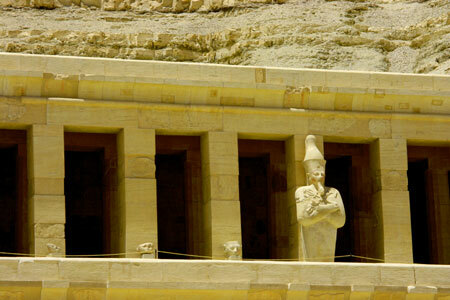 Hatchepsut is authenticity. 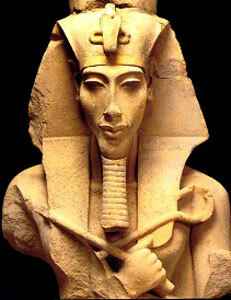 Akhenaton is divine love. Hathor is about love, beauty, music, and joy. And there is a Hathor Temple just around the corner here, so we will go there next. But I want to honor and acknowledge how many beautiful beings are walking with us today. I think that is what they were going to give us today. And I can see that are already ahead of us and know where we are going next. We will see what unfolds.